I confess. I didn’t do what I said I was going to. Remember how I planned to not stress and just have a few friends over and order pizza for Logan’s birthday? Ha, well, not so much. About an hour after I posted that I remembered, my little guy doesn’t like pizza. (What kid doesn’t like pizza?) Then it looked like the few people we invited might not make it, save for one child that Logan doesn’t really know. That’s when I decided to invite his two best buds from school. 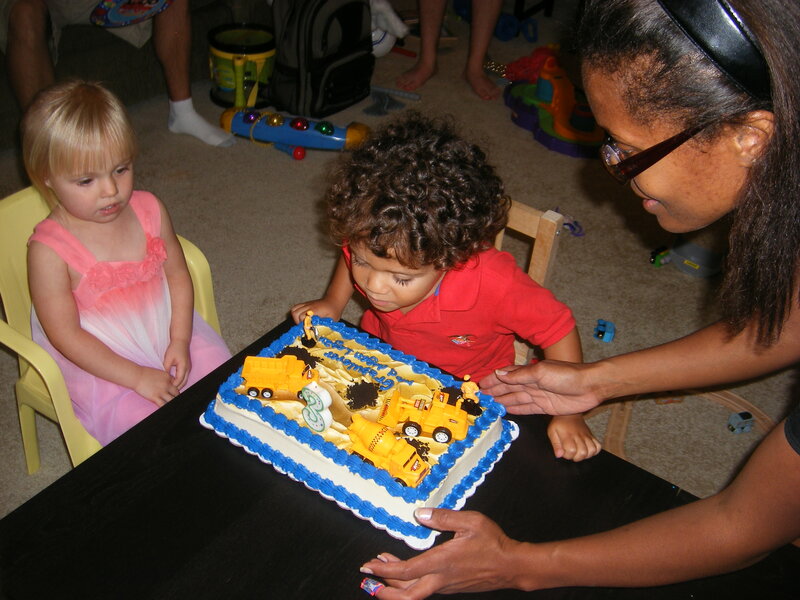 Logan's blowing out the candle on the construction cake at his 3rd birthday party. And here’s where the party went from easy to not-so-easy. A week before his party I remembered to buy invitations for the daycare kids and wrote them out in the school parking lot. Our friends got the ever-so-convenient Evite. While grocery shopping at the new store in the ‘hood, I ordered his cake. (Me? Bake? Whatevs, not since college.) Then I caught my hubby’s cold and that knocked me out for days. Everyone we invited RSVPed yes. Whoops. I told myself: OK, remember, this is supposed to be *not* stressful. Thankfully the day before the party, I began to recover and could get things together. I ordered food from the same see-and-be-seen new grocery store, then swung by the party store for a few decorations. Unfortunately the forecast called for rain, so no outside play for us. We have a split level town home and it gets packed easily. Especially when calculating the extra space toddlers need to bounce off the walls. I started racking my brain to figure out what to do with the little people. I hate party games, well, save for drinking games and you can’t really do Beer Pong with kids. Thankfully I like crafts so I set up two craft tables for munchkins. (Translation: end tables and small chairs) I had marshmallows in the house and toothpicks to make tinker toys. The second table was for making bugs. Logan and I sometimes do that with egg cartons, eyeball stickers, pipe cleaners and markers. Alas it was party day and I was stoked. Hubby played with Logan while I picked up the goods. The cake looked so awesome, I found myself showing it off to strangers in the aisles. Who was this crazy woman and what has she done with the previous me? The first two guests were Logan’s best buds and he exploded with shrieking, hopping excitement as they arrived. He gave them a tour of the house “Shawn! This is my bed! Cali! This is our stove! Shawn! 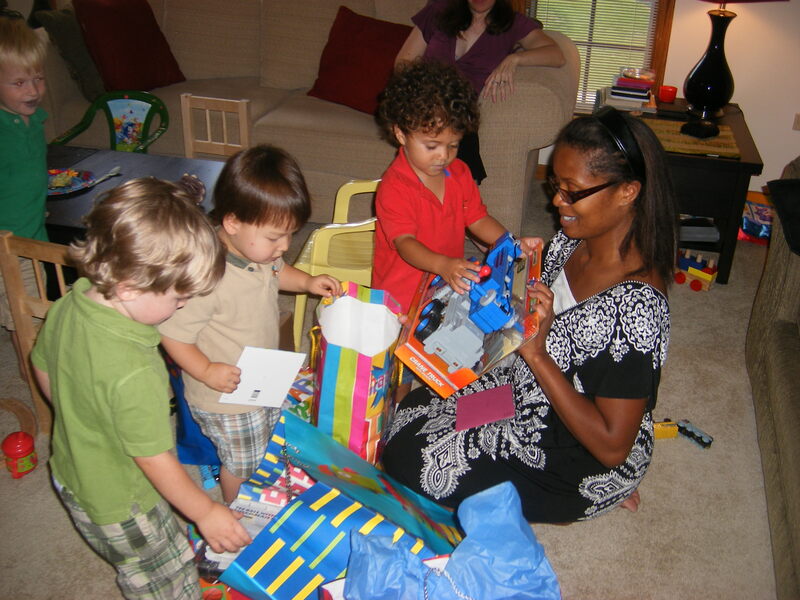 This is my mom’s…” He also loved sharing his toys with his friends, showing them how the excavator worked and even thought it was fun to have the other kids help him open his gifts. The crafts were a hit. Helping six kids make bugs was a bit like training kittens to jump through hoops, but it was fun nonetheless. While all the kids were downstairs, most of the parents were hanging out upstairs talking and noshing around a graveyard of toys. After the party one mom gave me the best compliment. She said it was great because she was able to relax and enjoy herself without having to think about her kid too much. I figured that though I didn’t have a party that was stress-free for the hostess, my kid was over-the-moon happy. And if I provided a place for other hardworking parents to get a little respite, well, that was more than good enough for me. I’m starting to get a little worried. My son’s third birthday is in three weeks and I have no clue what we’re going to do. For his first birthday we had a sizable party at the house. His second was at the local park district where the workers had great games and prizes for all the tots. This year I haven’t the energy to do either. The options, though, are seemingly endless. You can take a tour of the fire department and have cake at a nearby park, go to the swimming pool or a splash pad, there’s also always a trip to Chuck E. Cheese or those bounce house places. I’ve even heard of parents dropping thousands of dollars for petting zoos and carousels in the back yard, fake snow for sledding in the summer and dancing, singing Disney characters. With the exception of the aforementioned fancy pants party, I’ve considered all of these options. Many moms in my stroller-pushing set already had the hand-addressed invites in the mail by now. Not me. I’m pretty sure I’ll fire off a text to give folks a heads-up and then use Evite to spill the details. But details on what? I’ve even looked to Logan for ideas. He told me he wanted candles. OK. That I can do. Beyond that? I don’t know. And why do I care so much? Is it because I want it to be something he remembers? Kinda. After all I still remember my 5th birthday party at McDonald’s, which to me was THE best birthday. Is it because I want to impress my friends with a swanky kiddie soirée? Nah, those kind of people aren’t my friends. I think it largely stems from this exhausting need to have everything perfect. I want the perfect house, husband, child, career and all in my life should be perfect, perfect, perfect. Much of that need died when Logan was born, but it occasionally rears it’s ugly head. Thankfully life’s happenings usually knock me back to reality. And reality’s a good place to be. Hmm. I think I just figured out what we’ll do for Logan’s big day. Hubby can pick one family, I’ll pick another and we’ll have them over for afternoon of pizza and birthday cake. Problem solved.